Corporate Trade, or Asset-Based Trade is the exchange of unwanted assets or unused capacity in exchange for goods and services from the trading company. Here’s an example: Net Trade purchases an unwanted asset from Company A. Net Trade takes title and immediate delivery of that asset into our 300,000 sq. ft. warehouse in New Jersey. The unwanted asset in question has a book value of $1,000,000 and a liquidation value of $300,000. 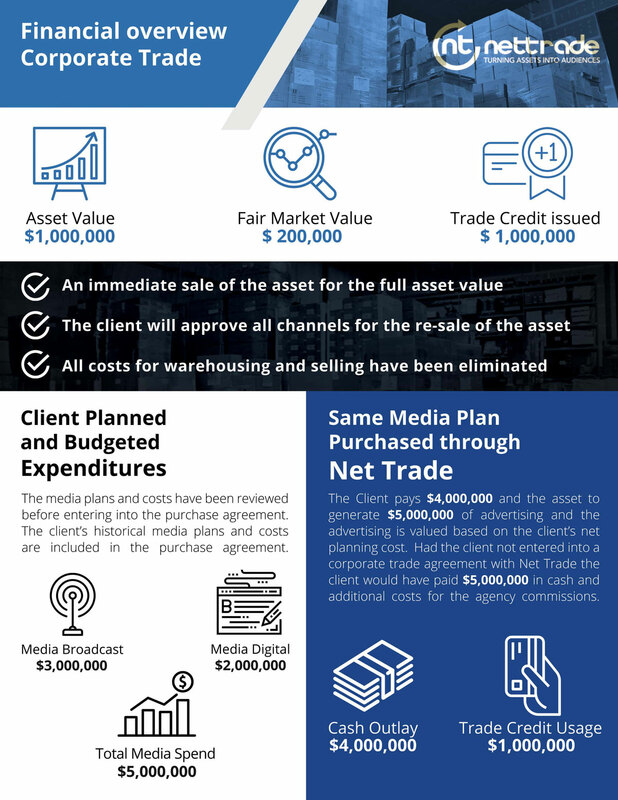 Net Trade immediately purchases the inventory for $1,000,000. Our payment is in a Trade Credit. In exchange for the higher value, Company A will use the trade credit as a portion of the payment for planned and budgeted expenditures placed through Net Trade. The inventory is sold by Net Trade into secondary channels and accounts that are pre-approved in writing by Company A.